Israel’s Blue and White party leaders are conceding defeat in Israel’s election, saying they will work against Israeli Prime Minister Benjamin Netanyahu from the opposition. Netanyahu’s office issued a statement Wednesday saying Trump “warmly congratulated” Netanyahu, who thanked the president for his “great support for Israel,” including the White House’s recognition of Jerusalem as Israel’s capital and Israeli sovereignty over the Golan Heights. Nearly all votes have been tallied after Israel’s parliamentary elections on Tuesday. Netanyahu holds a slim lead over rival Benny Gantz and is likely to be able to form the next government. Speaking with reporters in Washington on Wednesday, Trump acknowledged that it might be a bit premature to declare Netanyahu’s victory, but said he’s hearing that he’s won. Unofficial election results seem to give a solid majority in parliament to Netanyahu’s right-wing Likud and other nationalist and religious parties. The outcome would affirm Israel’s continued shift to the right and further dim hopes of resolving the Israeli-Palestinian conflict. The Palestinians have severed ties with the Trump administration. Trump’s son-in-law and senior adviser Jared Kushner has been working on a Mideast peace plan. Few if any details have emerged, but Trump says there will be “some pretty good action” on the plan soon. Israel’s president says his talks with political parties are to begin next week, in the run-up to picking the leader he thinks has the best chance of forming a stable governing coalition. Prime Minister Benjamin Netanyahu appears poised to be the president’s choice, with close-to-complete unofficial election results giving his right-wing Likud and other nationalist and religious parties a solid majority in parliament. Government spokesman Steffen Seibert said Wednesday that Berlin was waiting for the official result of Tuesday’s parliamentary elections. Foreign Ministry spokesman Rainer Breul said Israel is already fully aware of Germany’s concerns about Jewish settlements on occupied territory. Benny Gantz, Prime Minister Benjamin Netanyahu’s chief rival, says “nothing is over, we are making our moves,” despite election results that appear to hand Netanyahu a clear mandate for a fifth term. But the former army chief’s subdued tone differed starkly from his victory speech late Tuesday, when exit polls showed the rivals in a dead heat. With Netanyahu’s Likud poised to forge a coalition with its ultra-Orthodox and nationalist allies, Gantz advised the public to “see what the day brings,” without elaborating. Turkish Foreign Minister Mevlut Cavusoglu is urging Israel to abandon strong “rhetoric and populism” now that the elections are over. Cavusoglu’s comments were in an apparent reference to Israeli Prime Minister Benjamin Netanyahu’s recent pledge to annex Jewish settlements in the West Bank if he wins the election. Cavusoglu also called on the United States to be an “honest broker” in the Mideast dispute, saying a U.S. peace plan for the region must be fair and objective toward Palestinians. An aide to Palestinian President Mahmoud Abbas says the outcome of Israel’s election raises Palestinian fears about an Israeli annexation of parts of the occupied West Bank. Abbas aide Ahmed Majdalani says that Palestinians will seek the help of the international community to try to block any annexation plans. He said that the outcome of the election means a boost for what he called the “extreme right-wing camp” in Israeli politics. 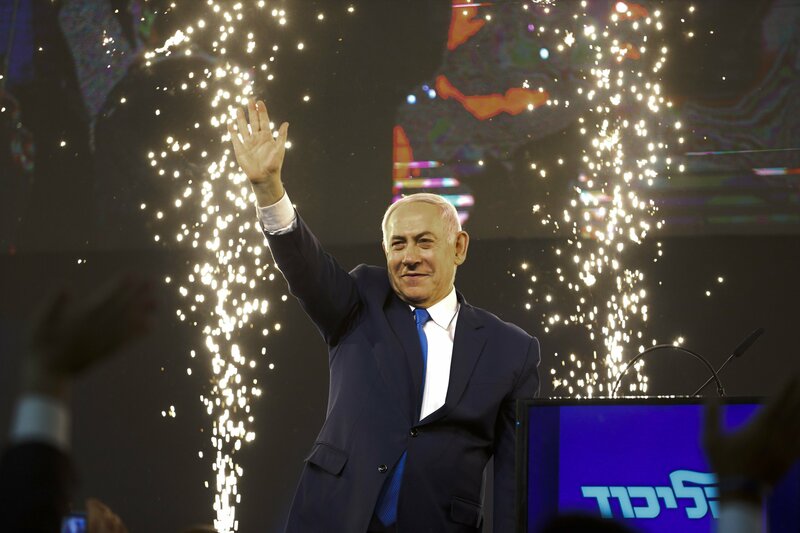 Benjamin Netanyahu appears headed toward a historic fifth term as Israel’s prime minister, with close-to-complete unofficial election results giving his right-wing Likud and other nationalist and religious parties a solid majority in parliament.